Documentation: Photograph: 4 May 2008 Crescent Lake NWR, Garden Co (Brogie 2009). Taxonomy: Four subspecies are recognized, three of which occur from Mexico south to Nicaragua, and one in the US: graciae, breeding from southwestern US and northwest Mexico south to northern Sinaloa (Stacier and Guzy 2002). The Nebraska bird is presumed graciae. 4 May 2008 photographed Crescent Lake NWR, Garden Co (Brogie 2009). Nebraska’s first Grace’s Warbler was found at the headquarters complex at Crescent Lake NWR by Cory Gregory. This species occurs north and east to south-central Colorado, where the range may be expanding northward (Stacier and Guzy 2002). The closest Colorado record is on the plains in Washington Co, Colorado 2 Jun 2006 (eBird.org, accessed May 2018), and there are a few additional records along the northeastern Colorado foothills, but none for Kansas (Thompson et al 2011). Photograph (top) of a Grace’s Warbler at Crescent Lake NWR, Garden Co 4 May 2008 by Cory Gregory. Stacier, C.A., and M.J. Guzy. 2002. 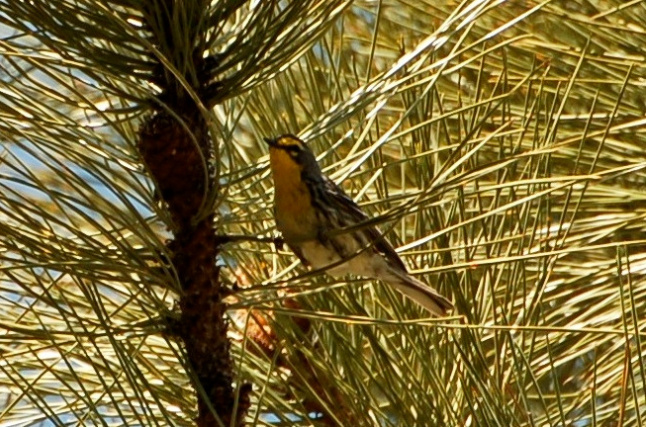 Grace’s Warbler (Setophaga graciae), version 2.0. In The Birds of North America (A. F. Poole and F. B. Gill, Editors). Cornell Lab of Ornithology, Ithaca, New York, USA. https://doi.org/10.2173/bna.677.